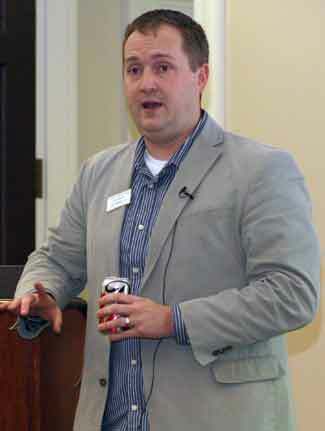 Joe Trebley ’01 highlighted Wabash’s first Ideaspark competition Friday night. Students were given 60 seconds to pitch their proposals to a small panel Friday night and those selected moved on to Saturday. In the 5 p.m. The winner of the IdeaSpark competition was Bar Buzz. The mobile app would give customers access to information on their favorite bars, while giving bar owners access to much needed customer data. The Grand Prize of a $1,500 S.E.E.D grant was given to the winning team of Jacob Alter ’14 and Chet Turnbeaugh’15 along with over $500 in free services from DeveloperTown, Accelir, and CNVRS Founder Adam Miller ’12. The runner-ups were PRJ Killing Superman and Distinguished Impressions, who both received $500 S.E.E.D grants along with services from Accelir. Alex Amerling went home that night with $183.20 after being awarded Top Participant by his peers after a great presentation and collaboration with the other participants. Trebley, a venture capitalist currently working for the Indiana University Research and Technology Corporation, returned to campus to provide the participants with advice he had learned along his way after graduating from Wabash. Trebley’s lecture covered all facets of the entrepreneurial world, from keeping a strong balance sheet to failing often. One of the most interesting pieces of advice Trebley offered was to fail often. People are often too worried about failing to try anything radically new or outside the box, he said. Instead, individuals stick to the status quo simply because they know the status quo works. Trebley even went so far as to recount his own career arc, going from the head of a promising biomedical startup with 50 employees to a struggling firm of five employees. But had it not been for those failures, Trebley told students, he would not have made his way to his current job. Early Saturday morning the teams reconvened for Open Forum, a think tank session, allowing them to collaboratively brainstorm through problems they had encountered the night before. Led by James Jeffries, the participants posted their questions across the room and then gathered around areas of interest to hash out possible solutions to issues that many of teams were facing. Detcheon International Hall cleared out as soon as it was over, as the teams separated to get back to their individual work. IdeaSpark had a big presence at the Saturday afternoon football game. 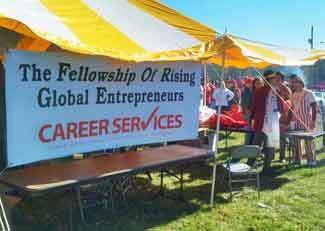 A Career Services' tailgate was a chance for the Wabash Community to connect with current students and recently graduated alumni as they showcased their ventures. Sean Grannan ’15 exhibited his handcrafted chainmaille jewelry; while Cahmelan Porter sold the latest designs of his recently launched clothing line. Frank Ruvoli ’13 jammed out live at the tailgate as food was eaten, connections were made, and business was hashed out. Frank Ruvoli ’13 brought his product Perfect-A-Block out as well, which is a patented catcher’s training tool that he has recently manufactured. Saturday's six judge panel consisted of: Jenny Vance, CEO & Founder of LeadJen; Sarah White, Founder of Accelir and start-up adviser; Keith Veal ’92, President & CEO of Sustainable Solutions; Greg Estell ’85, Principal of Estell Group, LLC; Aaron Abell ’09, Development Manager at Hillenbrand Inc.; and Adam Miller ’12, Founder & CEO of CNVRS.